IRAN’S MADMANAHMED IN CAHOOTS WITH AL QAEDA TO DESTROY DEMOCRACY IN IRAQ? Home World Middle East IRAN’S MADMANAHMED IN CAHOOTS WITH AL QAEDA TO DESTROY DEMOCRACY IN IRAQ? 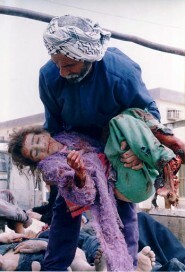 Iraq is on a knife egde; the question on everyones lips is will it plunge into civil war? After the destruction of the Golden Shrine of Askariyah by terrorists it is once again up to the brave men and women of the COW Armed Forces to hold Iraq together. But who is behind all the murder and mayhem in Iraq? And what do they want to achieve? Someone who is no doubt involved is the current leader of Iran, President Madmanahmed. He is relishing a chance to de-stabilise the fledgling democracy in Iraq and attack his hated enemy the US. And with the latte-left in the West blabbering on about “quagmires” and “another Vietnam” he thinks that he can deal a defeat to the forces of freedom. The question now is has he finally thrown in his lot with Al Qaeda to form an evil alliance. It is well known that many Iraqi insurgents are getting support from Iran, both in terms of people and equipment. And it has long been suspected that Iran has also facilitated Al Qaeda’s movement into Iraq from Afghanistan (the new Ho Chi Minh trail ). Well it appears that the crazed Tehran dictator may have crossed the line into active support for Al Qaeda. The explosion at the Golden Shrine was a professional job that could only have occurred with high level support from a rogue regime. And with Al Qaeda’s man in Iraq Abu Zarqawi reported as hiding out along the Iran-Iraq border all circumstantial evidence points to a joint Tehran-Al Qaeda operation. Where Al Qaeda’s #1 in Iraq Zarqawi is hiding. What is the aim of this diabolical partnership? To stop democracy taking root in the Middle East! Imagine if Osama is armed with nuclear weapons from the crazed Iranian leader? One of Iranian President Madmanahmed’s Nuclear Weapon facilities. These people will stop at nothing to further their aims; the thousands of innocent people they have killed in Iraq is testament to this. The war on terror is becoming clearer each day: the forces of freedom and democracy on one side, and the forces of chaos and tyranny on the other. Thank God we have a trio of World Leaders who know that the only answer to these terrorist madmen is the Iron Fist. President Bush and PMs Blair and Howard can win this war on terror if we all support them. As I have being saying since this war started, we in the West have to choose which side we are on: freedom, democracy and free enterprise; or hatred, barbarism, and ignorance. Will the chattering lefty peaceniks choose good, or once again let their visceral anti-Americanism drive them into the hands of madmen?